I've been hoarding some Serum No. 5 swatches (and have even more to come at some point in the future) so today we're going to do a good old fashioned swatch spam! This little collage doesn't even show all of the shades I've got lined up for you, so hit the break and let's get going! 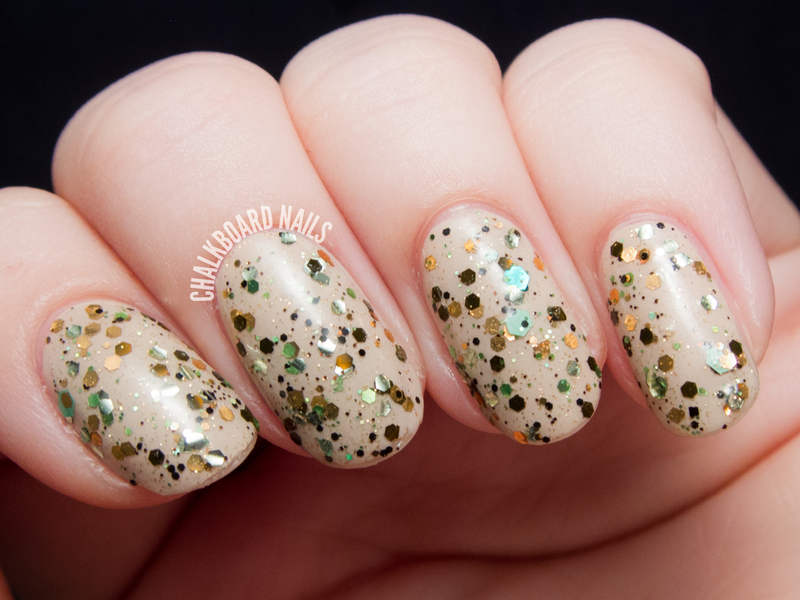 April Showers is an iridescent glitter topper with clean white shimmer. I've layered one coat over Misa Cherry Blossom Awesome. Blushed and Flushed is a delicate pink semi-opaque shade with silver and pink glitter. It could be built up to wear it alone, but for my swatch I chose to layer it over China Glaze - Spring In My Step. 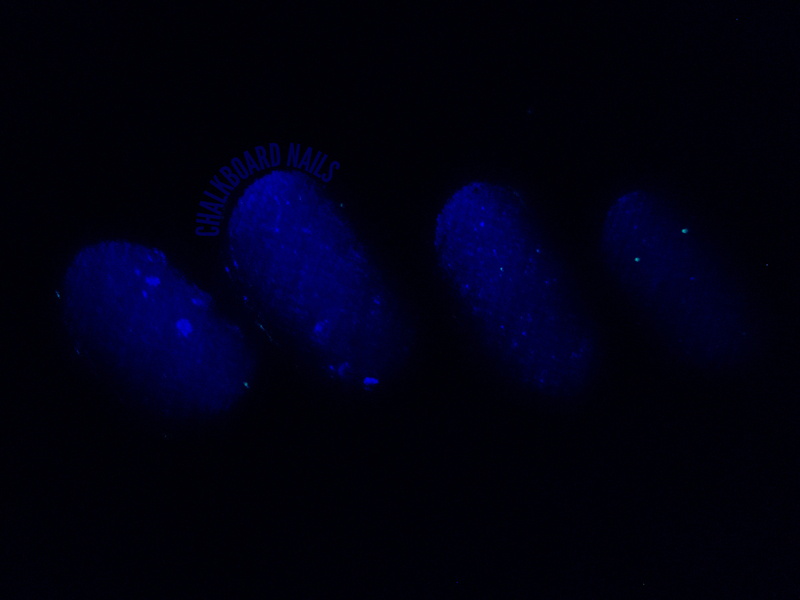 Final Countdown is a black jelly with a rainbow of glitter that glows blue in the dark. Because of the dark base, I had a very hard time seeing the glow of this one. I used three coats for the swatch below with two coats of topcoat. 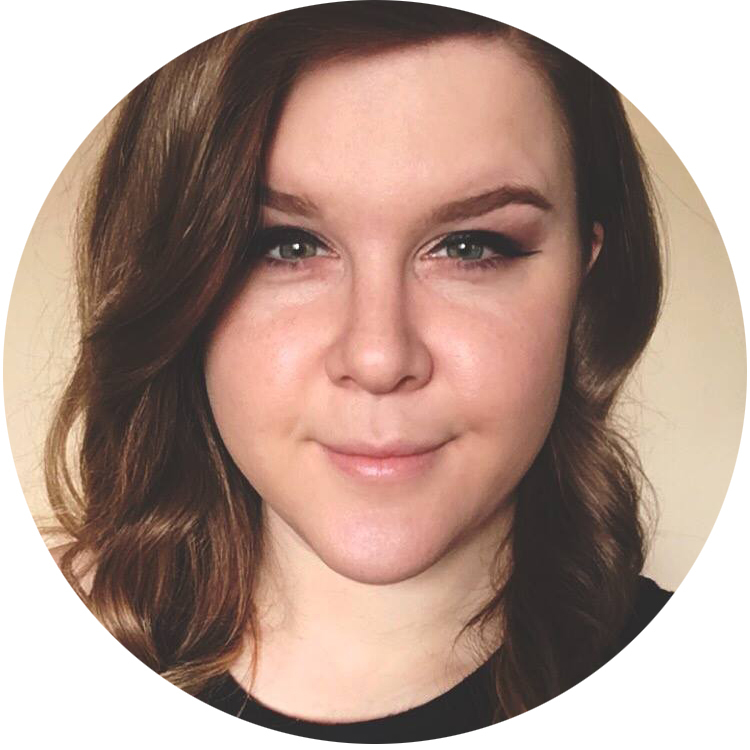 If I were wearing this again, I would likely layer one coat over a black creme. 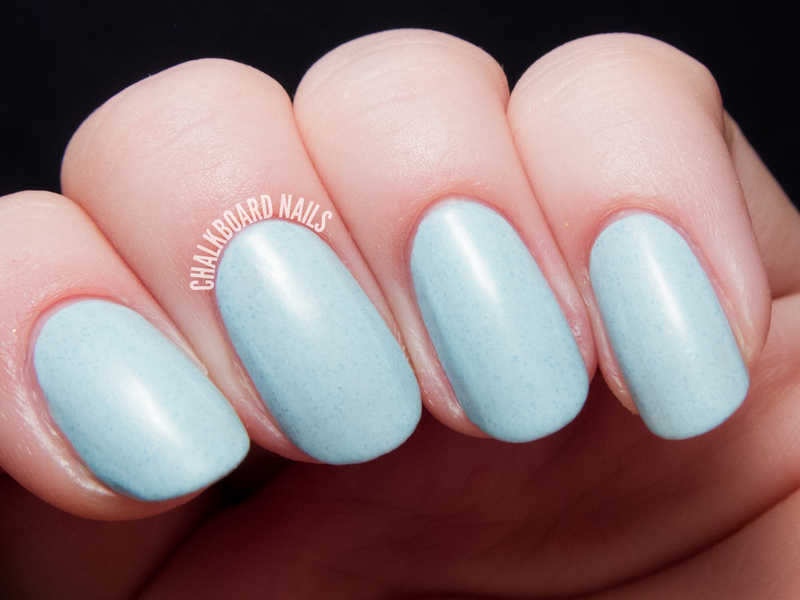 Friendly Tiffs is a Tiffany blue creme with subtle flecks. It had a great formula and it covered nicely in two coats. G.I. Miss You is a camouflage colored glitter topper in a clear base that glows bright green in the dark. 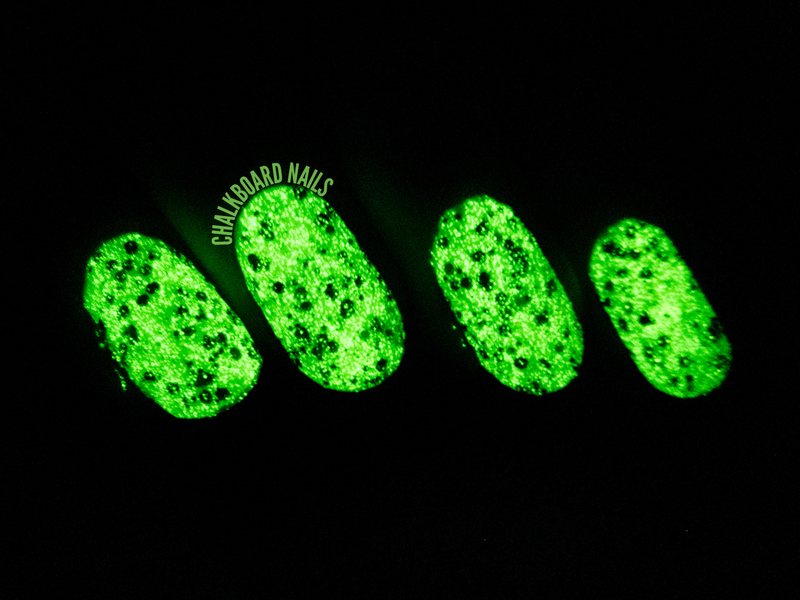 The glow on this one was incredibly bright, and the combination of glitter is super chic. 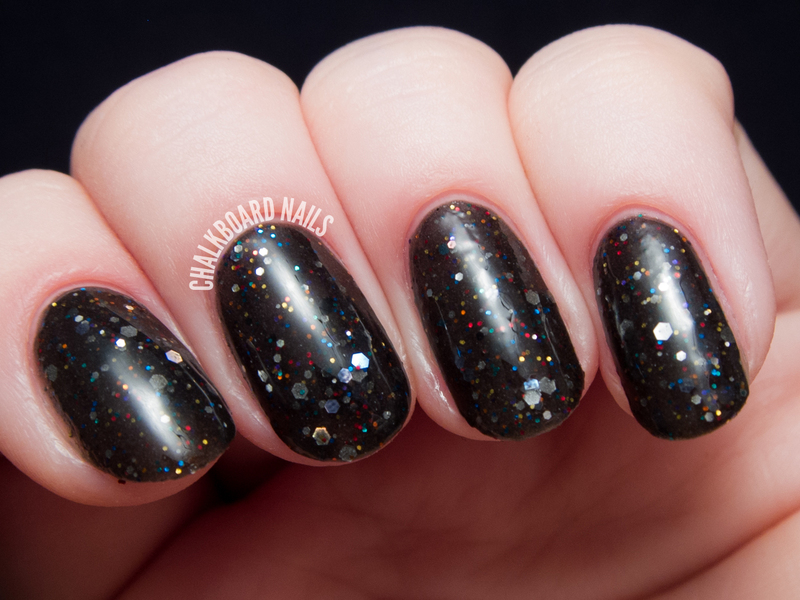 Definitely a great fall glitter! I layered one coat over Misa Dusty Magnolia. 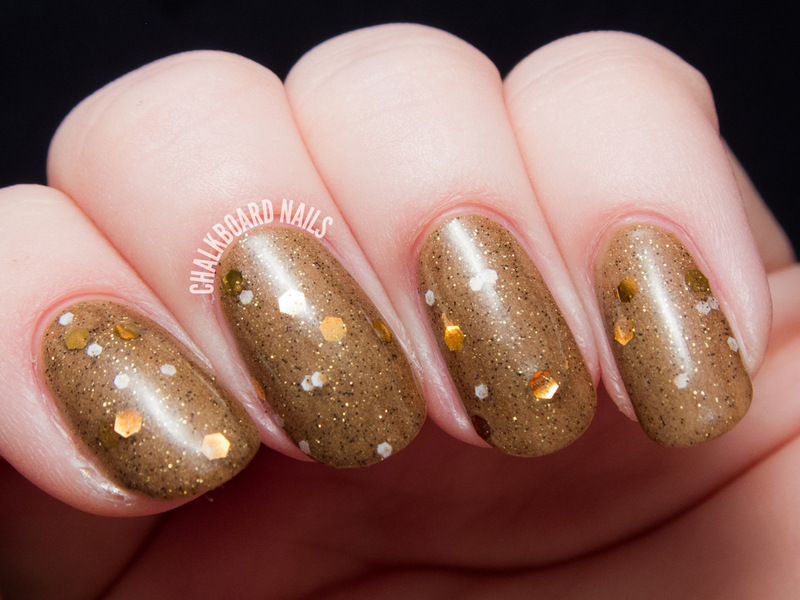 Gild Free is a holiday appropriate white semi-opaque jelly with luxe gold glitter. Three coats. 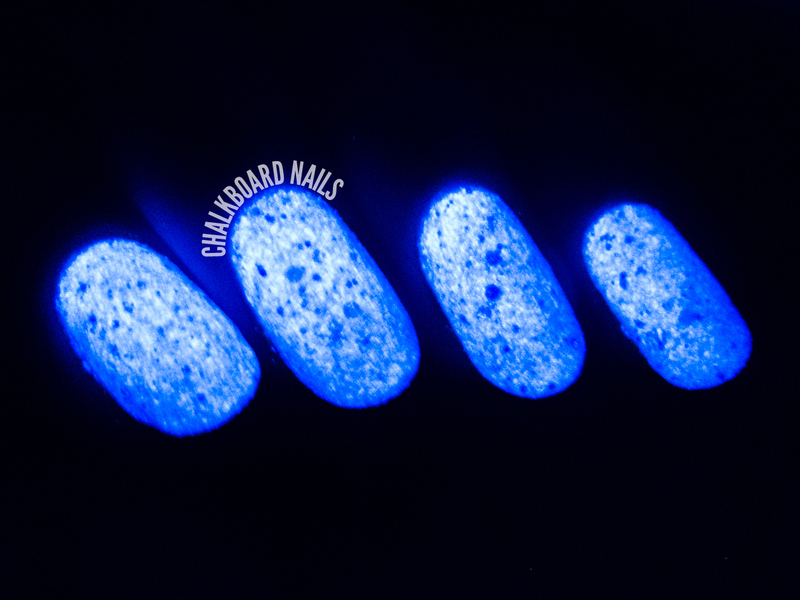 Girl's BFF is a silver glitter topper with microshimmer and hex glitter in various sizes. It's very dense; shown here is one coat over OPI Anti Bleak. Girl's Gotta Eat is, in my eyes, a sister shade to Girl's BFF. Where BFF is a silver topper, Gotta Eat is a gold. One coat shown over Nicole by OPI Goodbye Shoes. Holly Dazed is actually a holiday glitter shade, but I tried to show that it can be worn year round when layered with the right base! Here is one coat over China Glaze Metro Pollen-tin. Lilac It? I Love It! is a beautiful purple glitter shade in a semi-opaque lilac base. Like my swatch of Blushed and Flushed, I chose to layer this over China Glaze In a Lily Bit, though you could build it up to be worn alone if you want. 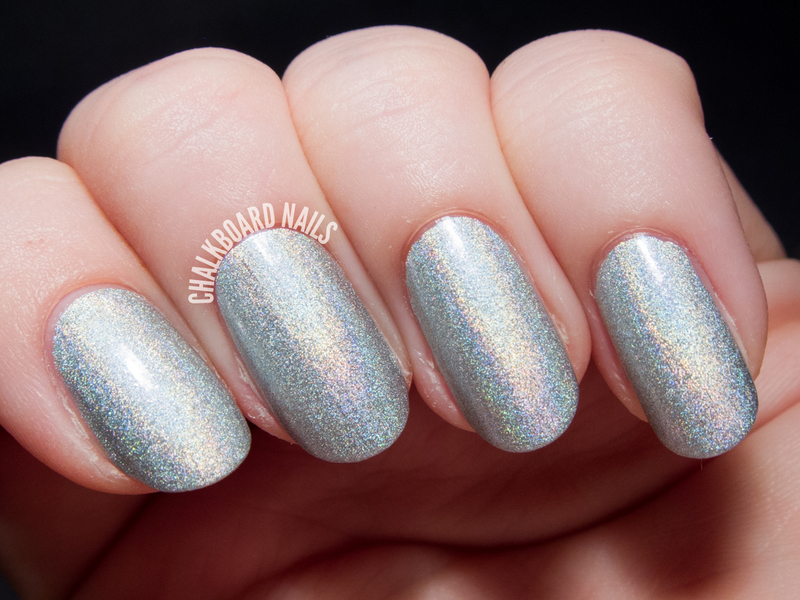 Luxe So Good is a powdery silver holographic. Two coats. 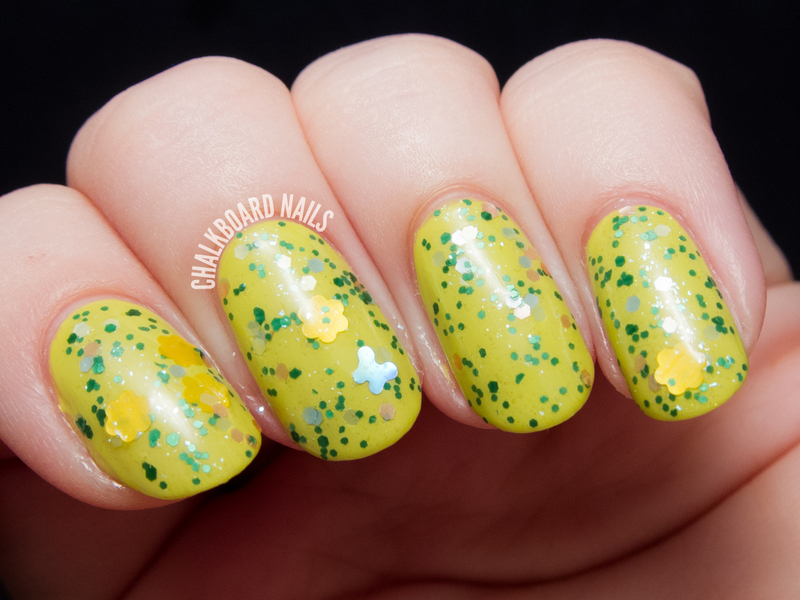 May Flowers is a cute green and yellow glitter topper in a clear base. It features flower and butterfly shaped glitter. I layered one coat over Nicole by OPI Sweet On Pete. Pink Peonies is a pinky-violet semi-opaque base with pink and white glitters. I tried this alone (3 coats) and layered, and much preferred the look layered. Here is one coat over China Glaze In a Lily Bit. Poppy Fields is a red jelly base with red and gold glitters. It still had a bit of a squishy look at 3 coats. Rise and Grind is a unique shade with gold and brozne glitters reminiscent of coffee grounds. I layered one coat over RickyColor Street Meat. 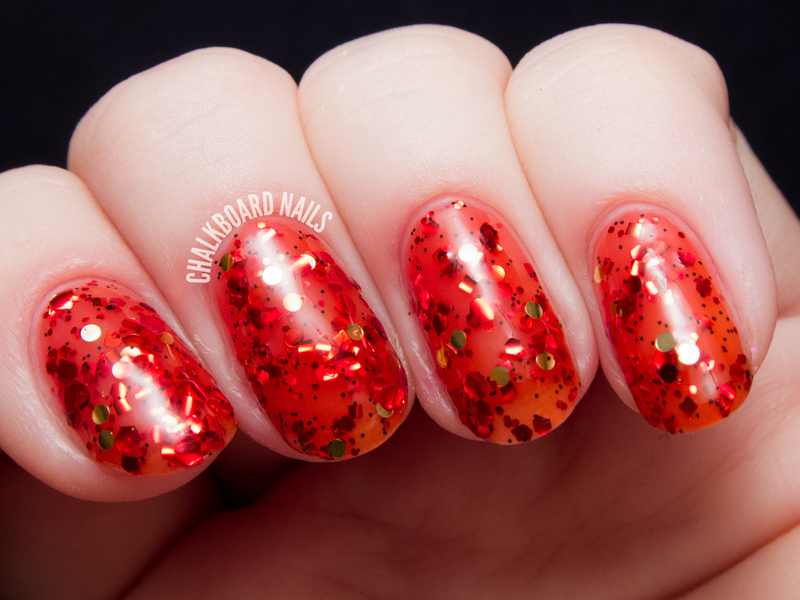 Samba-dy to Love is a vibrant red glitter mix. I layered one coat over Misa Blue Jade Vine. 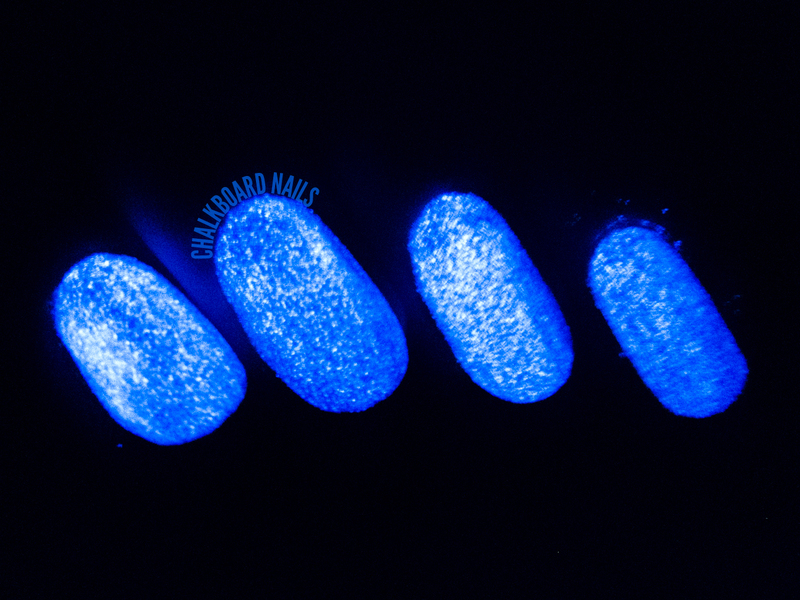 Sky Lights is a shimmery glow in the dark topper that glows blue. I layered one coat over Misa Great Grape. 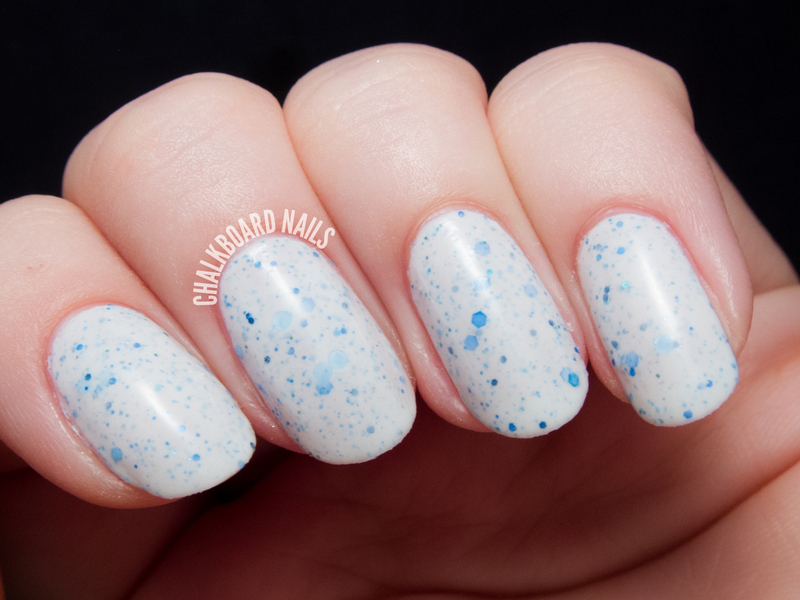 Snow In Love is a whitish blue base polish with pepperminty blue glitters. It glows bright blue in the dark. I really really love this one for winter. Three coats shown. Some Bunny Loves You is a fun and cute glitter topper. This was my favorite of the bunch! I layered one coat over Misa Loveliest of Lilacs. How adorable is this!? Which ones caught your eye? Serum No. 5 shades are available via www.serumno5.com. You can also catch the brand on Facebook, Instagram, and Twitter. I love all the glow in the dark ones, my favourite of those is Snow in Love but Rise and Grind really stands out for me, it reminds me of wet sand and the glitters kind of look like shells sticking out of the sand. Great comparison, I totally agree! Awesome swatches of these! So many pretty colors and glitters to see. G.I. Miss You is my absolute favorite! It's gorgeous. My shoddy decision making skills can't handle the overload of pretty. GI Miss You is fabulous! Love it! Snow In Love really caught my eye. The shade itself is beautiful and then that glow! Congratulations 31 Day Challenge Finishers!